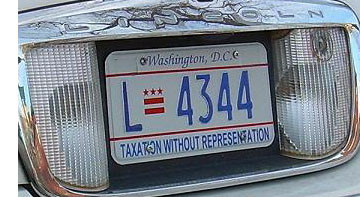 Ever since they were first issued in November 2000, Washington, D.C. plates with the unusual TAXATION WITHOUT REPRESENTATION slogan have attracted the attention of the media, plate collectors, and the general public. 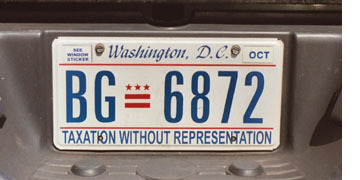 Detailed information about these plates, including the story behind the slogan's origin, how it came to appear on current D.C. plates, and physical characteristics of the plates may be found on a dedicated page. Click here to get there. 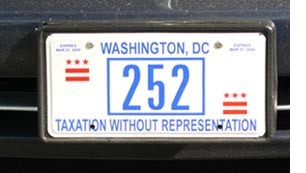 The remainder of this page is devoted to images of currently-issued Washington, D.C. plates of various types. Most include the TAXATION slogan, but some, such as motorcycle, dealer, and manufacturer, do not. 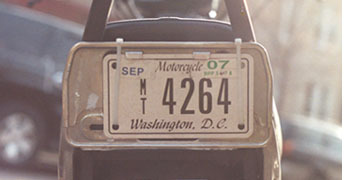 General-Issue Passenger plates are comprised of two letters followed by four numbers. When introduced in Nov. 2004 numbering began at AZ-0000. Plates of this type first had embossed characters, but since late 2001 they have been completely flat. Number BG-6872 is an example of the early style flat plate, characterized by dark blue figures and the city name in italics. Number CM-5744 is representative of the style now issued, with lighter blue characters and the city name in a sans serif font. Reserved-Number Passenger plates are numbered from 1 through 1250. 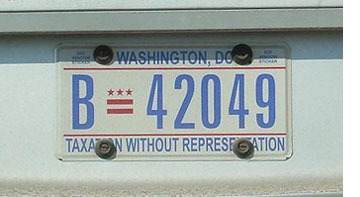 The numbers are reassigned annually (although many motorists are assigned the same number year after year), and new plates are issued annually in the spring. Plate no. 941 is an example of the 2007-08 issue, which was replaced at the end of March 2008 by the design to its right. More recent reserved-number graphics may be seen here. Personalized plates are available with up to seven characters. 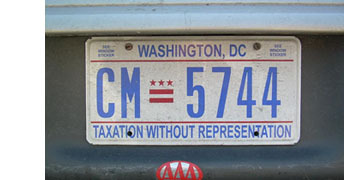 Motorists that choose to create their own registration number may, at their option, also add an image of the D.C. flag. 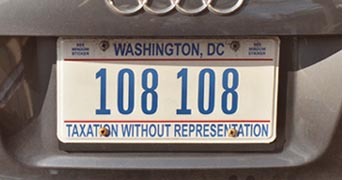 The repeated three-digit number on the plate on the left likely is a reference to the 108th Congress, which ended in 2004. Meanwhile, we are left to ponder whether the owner of the plate on the right is trying to say "Scrap Taxation Without Representation." Motorcycle plates presently being issued bear no resemblance to other current plates. They are black on white and include the italic font for the city name that was abandoned on plates of other types several years ago. They also continue to be validated with stickers. 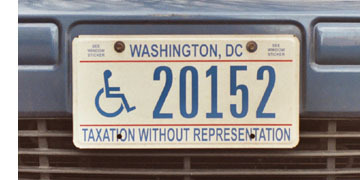 Disabled motorist plates feature the international symbol of access. 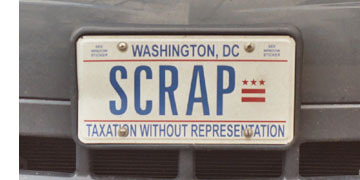 Although placards displayed inside the vehicle have replaced distinctive plates in many of the states, D.C. continues to issue special plates to qualifying individuals that request them. Bus plates begin with a letter B.
Plates for Livery vehicles feature a letter L prefix. 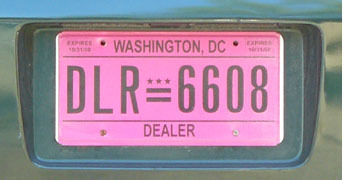 Dealer plates have been reissued annually, in different and noticeable color schemes, since late 2004. 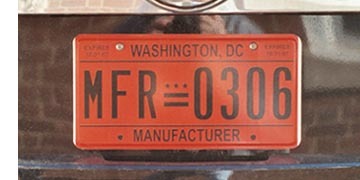 The dealer registration year begins Nov. 1 and ends Oct. 31, and the plate pictured here is the 2007-08 version. This is the 2006-07 version of D.C.'s newest type, Manufacturer. Like dealer plates, they are replaced annually at the end of October. As of early 2007 only General Motors is known to be using them.